A bargain board with angular looks, but does anyone remember Fatal1ty anymore? An absolute bargain Z77 board, perfect for the peripheral-heavy gamer, and pretty good for everyone else. Slightly off on the overclocking side. Slightly. Hitting the more bargainous end of the Z77 motherboard market is the excellent ASRock Fatal1ty Z77 professional. 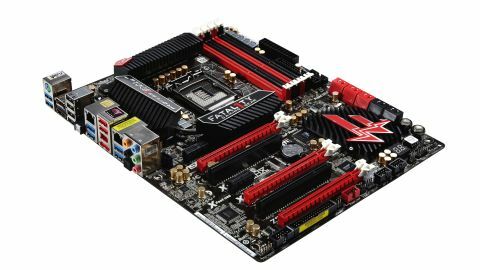 But,were it not for the massive 'Fatal1ty' branding on the chipset heatsinks of ASRock's Z77 Professional you'd be forgiven for thinking you were looking at one of Asus' Republic of Gamers boards. It's finished in the same sort of black and red styling, with large heatsinks and a plethora of connections that have become almost synonymous with the RoG brand. ASRock has even started using the single clipping DIMM slots that Asus has been pioneering. Unlike the RoG boards though the ASRock Fatal1ty Z77 Professional is resolutely aimed at the gamer. Realistically then it's a great board to be pairing with the Intel Core i5 3570K Ivy Bridge CPU. That may sound odd given that gaming is in the Asus brand's name, but the series has moved ever further away from actual PC gaming and more into the enthusiast/liquid nitrogen-sniffing overclockers market. The ASRock Fatal1ty Z77 Professional is totally set up to rock your gaming world. And for a very reasonable price it's got a hell of a feature set too, even down to the legacy IDE support so you wont necessarily have to ditch your current PATA optical drive. In the X264 and WiC benchmarks you can see the Gigabyte and Asus boards holding quite a lead which is because they're Turbo-ing to 3.9GHz by default, whereas the Intel and ASRock boards are running at 3.7GHz in Turbo. In general performance terms though the Fatal1ty board stands up well against the pricier competiton.